Not only did I feel frustration from losing the ability to do the one thing – running – that normally comes naturally. I also felt ashamed, like a failure, because Jacob is one of my clients. I had coached him all year to develop as an ultrarunner, and I invited him to pace me as part of his training. I wanted to show him the right way, not the wrong way, to handle a 100-miler. Instead, he was witnessing my blowup. Three weeks later, Jacob accomplished a strong finish at the 170-mile, self-supported Grand to Grand Ultra stage race. As we talked through a postmortem to analyze his performance, he said something that pleasantly surprised me: “Watching you struggle was a really useful experience for me.” He elaborated on how it helped him cope when his legs temporarily failed him during his ultra. His words came back to me as I assumed the role of pacer during the final 30 miles of Rio Del Lago 100 in November. I found it instructive and inspiring to see my runner, Mae Barker, reduced to what she called “zombie state,” and then to figure out how to coax her back to a little bit of running through an elixir of sugary calories, advice on footstrike, and a wacky story about the time I paced someone who had diarrhea and needed help with wiping. “We can run to that ribbon,” I said, and Mae did, and a little while later she found the wherewithal to run some more and break 24 hours. Pacing someone through those late-night miles develops empathy and skills for handling the painful final stretch. As a pacer, you are reminded of why and how thirty seconds of jogging can feel heroic at Mile 88, which helps you manage your own zombie state at your next ultra. I’ve heard legit arguments against having pacers; for example, pacers crowd the trail and the aid stations, and they detract from the self-reliance that ultrarunning should foster. Running 100 miles solo is a badge of honor – I get it. 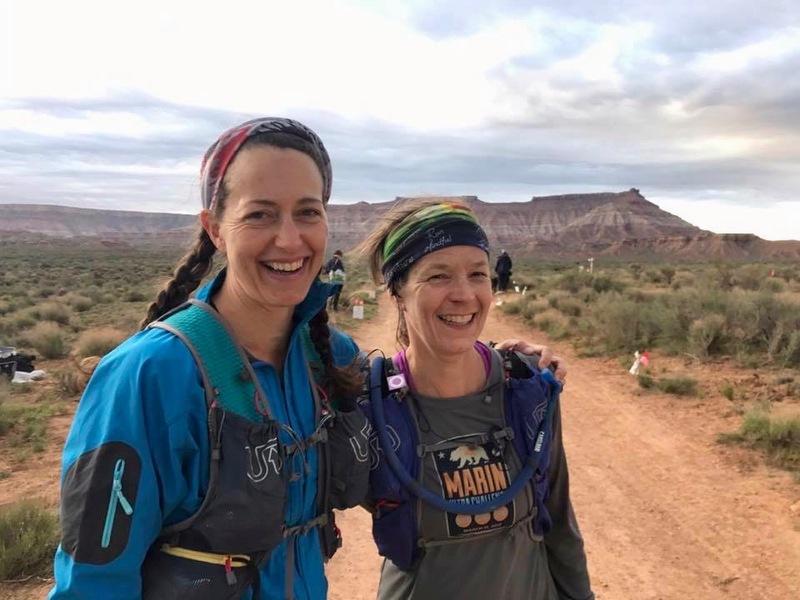 But I also believe this buddy system known as pacing can be one of the most special – and to borrow Jacob’s term, useful – aspects of running 100-milers. Consider the apprenticeship aspect. I have paced at the Hardrock 100 four times. Seeing my runner last summer, the speedy Mark Tanaka, pelted by a hail storm and reduced to leaning on his trekking poles for a two-minute nap midway through Hardrock makes me better prepared to safely and smartly handle the rigors if ever I get the chance. Pacing also leads to deepening relationships, aka bonding. At the 2015 Wasatch 100 and 2016 Western States 100, my mind mulled cringeworthy memories, and my mouth mercilessly blurted gossip under the cover of night and through the haze of exhaustion. My pacers, Jennifer O’Connor and Clare Abram, listened sympathetically, acted as quasi-therapists and got me to laugh. Friends who run all night, poop in the woods and get lost together, stay together. As you consider your training and racing schedule for the coming year, ask yourself: Who would you want to help – and learn from – through pacing at a 100-miler? How can you be the most helpful, patient and uplifting coach/friend/apprentice during those grueling miles of your pacing gig? Speaking of partnerships, I want to close by thanking UltraRunning for inviting me on board as a columnist. I’ll share this page, alternating each issue, with my friend Errol “The Rocket” Jones. I’ve been a loyal reader of UR since the mid-1990s and still celebrate the delivery of each printed issue in my mailbox. I look forward to sharing scenes and lessons from this sport, aiming to make this column a pacer of sorts that will motivate, guide, support and entertain you on your ultra journey.